DESCRIPTION: The work presented here is by the staff and students of Alesco Learning Centre. The piece is a synthesis of the work made during the Visual Design Course at Alesco. The form of the sculpture is based on a Dream Catcher which is a favourite design motif of students; included with this is the sign and symbols that have been generated by the students throughout the coursework and then put together to reflect the themes of the Air Equinox with the chosen motif ‘Mirrors’. The elements in the sculpture are mirror, flowers, feathers, arrows, gold and silver; these elements are symbols of love, truth and beauty, flight, dreams, and the imagination. We dwell in possibility. Our main working group is year 11 students of the Visual Design Course at Alesco. The year 11 students and teachers came up with the overall design and concept of the sculpture. 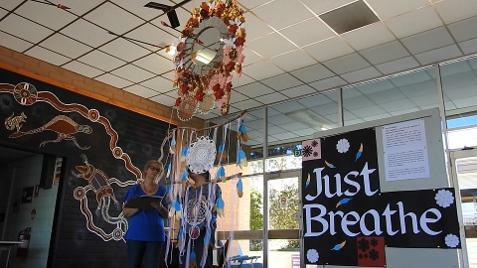 The students in year 9/10 participated by creating the many paper elements of this installation. The whole school has been involved in the installation of this sculpture.